Oh brother…here comes the salted caramel again. I’m sure that’s what your thinking as soon as you saw this post. After all the salted caramel posts in July (plus the caramelized bananas in this sundae), I’m sure you’ve had your fix of the buttery, gooey, deliciousness. But guys! Don’t walk away yet! You’re mind is gonna be blown by this Salted Caramel Apple Pie Dip. And if not by that, then definitely these Cinnamon Sugar Pie Crust Chips that we’ll use for dipping. Yup, chips made from pie crust. Now you’ve seen everything! This dip was inspired by my new love for dessert dips. I first made a classic cannoli dip earlier this year and fell head over heels for it. I was shocked at how little I missed the cannoli shells – I was straight-up eating the dip with a spoon. No edible vessel required. After such a successful first-attempt at a dessert dip, I decided to expand my horizons of this recipe category and try a recipe I’ve been eyeing on Pinterest for a while – apple pie dip. Before we get into it, let my air one of my grievances about dessert dips. While searching around for ideas, I saw sooooo many dessert dip recipes that use whipped topping or cream cheese to add weight to the dip. But, in my opinion, most times, the dip can stand on its own with out it. For example, for apple pie dip idea, many recipes simply mixed cream cheese, brown sugar, and spices together and served with apples and then called apple pie dip. No, ma’am. If you’re gonna call it apple pie dip, I want it to have apples in the dip and the consistency to match that of the classic pie. So that’s how I landed on this killer recipe from The Cooking Spot. It had the textures I was looking for and featured apples directly in the dip. Hallelujah! To make this dip extra decadent (per the usual), I added homemade salted caramel sauce. Salted caramel sauce is so easy to make at home, so I highly recommend trying it out. But you can also buy it in the ice cream toppings section of your local grocery store or, hey, Amazon has it too. As if this dip wasn’t insane enough on it’s own, there are Cinnamon Pie Crust Chips that are perfect to serve along side of it. To make these, all you’re doing is buying raw pie crust. But make sure you buy the one that’s not already in a pie mold. Then, you roll out the raw crust, brush with egg wash so that it gets perfectly crispy and gorgeous, and then slice into rectangles/squares/triangles/whatever shape you want. Bake for 12 minutes, brush with butter, and finally sprinkle them with cinnamon sugar. See how simple! Are you ready for the tips??? Sure, you are! Many of you have told me how much you love them so I’m glad to share that today the tips are *extra* helpful because they’re super specific to this recipe. How do I know? Well, I learned them all during the recipe testing, of course! See, food bloggers are just like you – still learning everyday. 1. When I first read this recipe, I was a little shocked to see that the apples were cooked in a saucepan, rather than a saute pan, like I would have done. But the apples actually cook better when they stacked on one another. This creates a steaming effect and cooks them better. It also keeps the moisture from cooking off really fast. We want that moisture to create the gooey texture in the dip. 2. If you plan to make the salted caramel from scratch, make sure you do so ahead of time to give the caramel time to cool a little bit. It’s okay if it’s still hot – you just don’t want it to be boiling hot when adding to the apples for fear that they might cook too long and get mushy. 3. Make sure you’re watching the apples as they cook and tasting them every so often. If you give them a taste and they are getting cooked but not creating a gooey texture, add a little water to help things along. I had to add about 1/4 cup a water in all but that maybe different for you, depending on the apples you use. Moral of the story- keep an eye on them and don’t be afraid to taste them as they cook. 4. The pie crust chips are a little delicate, as pie crust can be. So I recommend spooning on the dip, instead of trying to scoop the dip with the crust. This delicate texture had me curious if a cinnamon pita chip or cinnamon tortilla chip would be better as a dipping vessel. They were, when it came to texture. However, the buttery flavor and flaky texture of the pie crust was irresistible to both me and my husband so the pie crust chips won out in the end. There you have it – the dessert dip that is full of fall flavors but easy to make all year long. What other dessert dips are you making? I need some more ideas! Let me know in the comments below! Peel and core your apples. Dice into a small cubes. Add to a medium sauce pan. 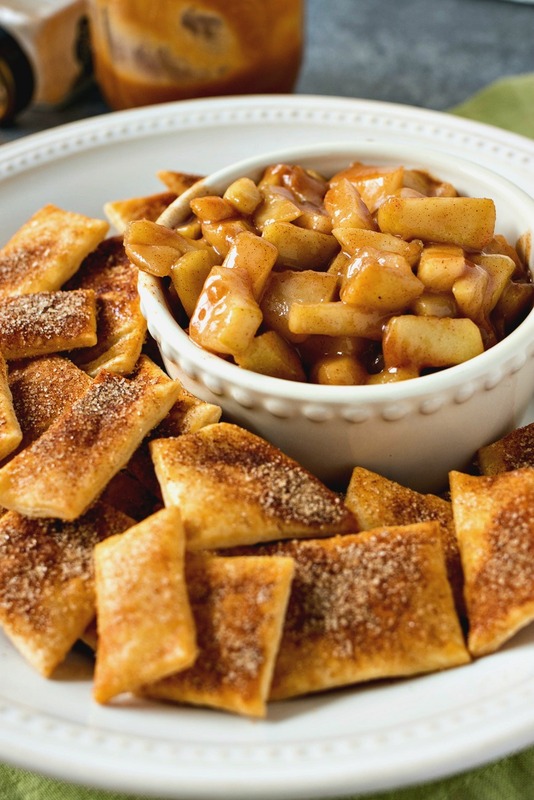 Add cinnamon, apple pie spice, brown sugar, salt, and flour and toss apples to coat them. Add half of your water and stir. Place saucepan over medium heat and stir occasionally. Apples will begin to cook and soften. They should release their juices. If you don't see a lot of liquid after 7 minutes, add the rest of the water. Cook for another 3 minutes, or until apples are al-dente. You don't want them mushy but they should taste cooked. Remove apples from heat and let them cool for 5 minutes. Add salted caramel sauce and combined. Taste apples and add more salt, if needed. Serve with pie crust chips (recipe below). Preheat oven to 350 degrees. Line pan with parchment paper and set aside. Remove pie crust round from the fridge and lay on clear counter. Create egg wash with one egg and 1 tsp water and whisk together. Brush egg wash over pie crust. Slice pie crust into 2-inch strips. Cut perpendicularly to make the strips into rectangles. Place rectangles onto baking sheet and bake in preheated oven for 12-15 minutes, or until golden brown. Remove from oven. Toss cinnamon and sugar together. Brush the pie crust pieces with melted butter. Sprinkle with cinnamon sugar. Let them cool for 10 minutes. Serve with salted caramel apple pie dip. This kind of deliciousness should maybe be illegal. I mean really, I don’t even know if I can handle that dip on a perfectly cinnamon sugar coated pie crust chip. Love! You’re so right! Thanks for the love, Karly! It really is, thanks so much! This looks like an awesome dessert recipe! Can’t wait to try it out–sharing to Pinterest! This looks SOOOOOO GOOD! We have TONS of apples from apple picking and I’ve been trying to decide what to do with them, and this looks like a winner no doubt! What an amazing recipe for this time of year! And I love the idea of using the pie shell for chips. Aren’t they the best??? And so simple too! Love pie crust chips! Ok so this looks AMAZIIIIING! I can’t stare at those chips any longer – now I want tthem! This looks like such a simpler, and maybe healthier? ?, take on apple pie! Ugh, I can’t wait to try this!! Aw thanks so much! Love this whole comment. You’re the greatest! Wow what a great alternative to pie! This look delicious! I actually pinned this yesterday and can’t wait to make it. It looks DELICIOUS! Lord almighty!!! These look SO good! Pinning for later, maybe Thanksgiving! These will be such a hit! This looks amazing! I love the idea of using pie crust chips! Can’t wait to try. Thanks so much! This dip is a MUST try, for sure.